Daily Mass was pretty cool this morning. During the recessional hymn, all the campers linked arms and sang pretty awesomely. I could see the normal parishioners across the chapel lookin’ pretty touched at how close we’ve grown in a short amount of time. I think some of them were even weeping! Wow… I found out later that a few of the parishioners thought it was absolutely beautiful how we’ve grown close and that our love of God was clearly shining through our lips and hands/feet this morning. Opened lips and proclaiming God’s praise… Legit. ..Not gonna lie, we sounded pretty good. After Mass, we all broke off to go to our different work sites. Today we stayed at SVDP to work sanding, priming, and painting baby cribs that the other CFW sessions this summer have already built. Kind of mindless work. Due to its mindlessness, it made for good opportunities for singing today’s hottest hits like Carly Rae Jepson, T-Swift, Biebs, One Direction, etc. Karaoke and sanding down wood does go together! But as we were doing all this work, I couldn’t help remember for what purpose these cribs were for. Just the thought of helping out a family and baby in need warms my heart. 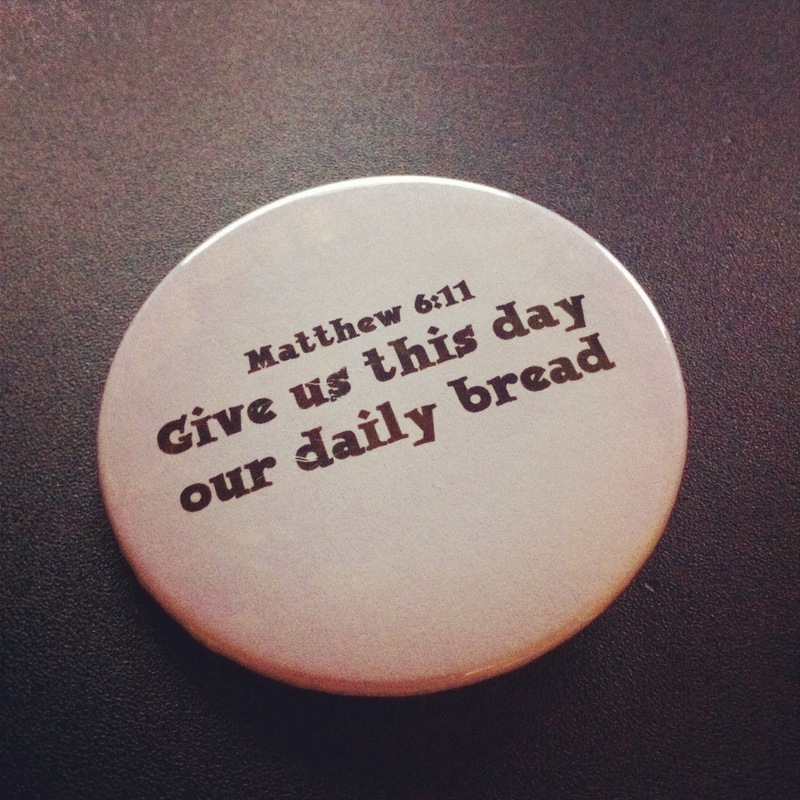 Today’s camp Scripture is “Give us this day our Daily Bread.” To me, this means that God provides for all that we need to live, and I can’t help but think that we, campers, are the hands and feet of God providing for the needs of those who really need it. Awesome. I should also say…this was good bonding time with others because there’s not much to do if you’re just there sanding and painting. And the iPod cut out multiple times. What better way to break the awkward silence than by talking to the other people right there with you, eh? And of course, we had another brainstorming session of cheesy pick-up lines, thanks to Arturo. But other than that, pretty cool day. And by that I mean, cool afternoon because we stayed inside priming and painting the cribs because it was super hot outside. After dinner, we spent time in the chapel to be in silence while writing in our journals. I pondered more on my “vacation” this week and realized that wow, I really need this time to be more directed at others rather than myself like I have been lately. And I acknowledged the peace in my heart that stems from knowing that I’m not focused on me. Refreshing! Then I started thinking about my ministry at my parish and how the example of the A-Team has inspired me to innovate for my ministry. And after thinking about that, I looked at the other SEAS kids that I could see…and then I felt blessed that each and every single one of them (even those I couldn’t see in the chapel from where I was sitting) are here at CFW because I know it’ll ignite a fire in their hearts that I have to somehow figure out how to capture for our stuff back at home. “Take it home!” …that is our take-away from Camp Fort Worth. After we had silent journal time, we gathered back up in our main meeting area to pray the Luminous Mysteries of the Rosary. I loved the A-Team Coordinator’s reflection on the Rosary…how every time we pray a Rosary, it’s like giving Mary a bouquet of roses. It’s like…for every Hail, Mary…it is like presenting her with a rose. Cool stuff. It reminded me of St. Louis Du Montfort’s book, Secrets of the Rosary. Then we had free time. And I got into some intense games of Big Booty. Yes, with some of the same people I was playing Pterodactyl with the night before. I didn’t climb high enough to become the Big Booty, but it was pretty intense. So, whenever I write these blog posts…it’s most likely I’m sitting here, on this air mattress, and it’s probably past lights out…but…at the time of the writing of this sentence, 11:37PM, a bunch of guy campers are playing guitar and singing in a circle and dancing to a bunch of praise and worship songs next door. Right now, “Hold Us Together” by Matt Maher. That’s freaking awesome . I’m glad that it’s only Tuesday and the guys are already such bros. I was trying to converse with the other adults in the room and blog at the same time when I heard music coming from next door. I decided to take a peek and see what’s going on. And I peek my head in. And lo and behold, a bunch of campers and A-Team guys are surrounding my small group’s A-Teamer with his guitar…and they’re all dancing/swaying/singing in a circle. Totes bro moment. I let them be and went back to my bed to blog some more. So earlier today during #SEAStalk, I had everyone share their typical high, low, and God moments. Once again, Arturo joined our circle, but he had really awesome stuff to say and the feedback I’ve been getting from everyone has been pretty great so far. Not only that, another camper from another parish joined us and she had pretty cool moments as well. Again, I think it’s great that everyone is so open and willing to share. In general, as if the above examples don’t already reflect it, but you can definitely tell that friendships are forging and deepening here at CFW and it’s only Tuesday. I was talking to one of my SEAS youth earlier and we agreed, it’s going to be really sad on the last day when we all leave. We’ll get there when we get there. Just got to enjoy every moment. Tomorrow we help out around here at SVDP. Painting babies. Silence. Bro moments.